Above, a simulated view that attempts to show what it was like collecting calcite and fluorite on the mine dumps at Castle Dome. That's George standing by his tent in front of the small hill where the entrance to the Hull Mine is located. The sun had gone down on the Fourth of July and we were about to see a spectacular red and blue "fluorescent fireworks" display - hundreds of specimen like these piled up a short distance away. 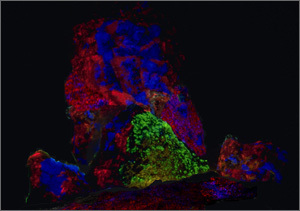 The mine dumps were left-over piles of rock containing countless fluorescent specimens. Our job was to pick out the good ones and load them into the truck. It was an excellent night for collecting - we were far away from civilization in the remote Castle Dome area under a desert full moon. It was a real trip, as we used to say! The mine dumps at the Hull Mine contain fluorescent specimens like these: mostly red calcite with blue fluorite. The next day we had to get going very early. We were headed up north to the Quartzite area to collect zunyite. Click on the link to continue.